As a child, I was blessed with parents who loved to travel. Whenever my father had vacation time, he would plan a family trip to a number of destinations along the east coast. 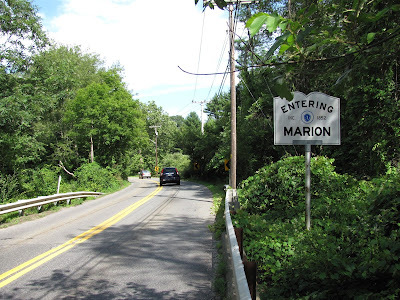 But the trips that were most memorable were the summer trips we took to my mother’s grandparents’ house in the small town of Marion, Massachusetts. The five-hour car ride from our home in New York to my grandparents’ home in Massachusetts was always an adventure. My mother would pack our favorite snacks, and as we crossed from state to state my dad would play the license plate game with us as he drove. I can still remember how excited my brother and I were as we called out the license plates we spotted on other cars traveling the interstate. We always looked forward to stopping at the roadside Howard Johnson’s for lunch and a box of saltwater taffy. It was one of our summer traditions. But it was nothing compared to our squeals as we came upon that sign. Entering Marion. It was our signal that we were just minutes away from Nana’s house. I can still hear the crunch of the white gravel as my father drove down the long driveway that led to the back of the house. As I look back now, I have to wonder if my grandmother heard it, too, because she was out the back door within seconds of our arriving. After all the hugging and ‘look how big you’ve gotten’s, my brother and I would run upstairs to the small room we shared, aptly called the twin room for the set of twin beds it housed. As the oldest I always grabbed the bed closest to the window. I used to love to lie in bed before drifting off to sleep and stare at the cape ceilings. I think I had every crack and line memorized. Our visits usually lasted anywhere from a week to ten days, dependent upon my dad’s vacation time from work. During that week or so, we spent all of our time with my grandparents, my aunt and my three cousins, all of them girls. My poor brother! He truly was the odd man out, but even still we all had fun together. We loved playing out in my grandfather’s huge backyard that seemed endless with its strawberry and raspberry patches. There were also a dozen fruit trees – pears, apples, peaches and plums. My grandfather was a farmer, and my grandmother knew how to can and preserve everything that grew in those gardens. 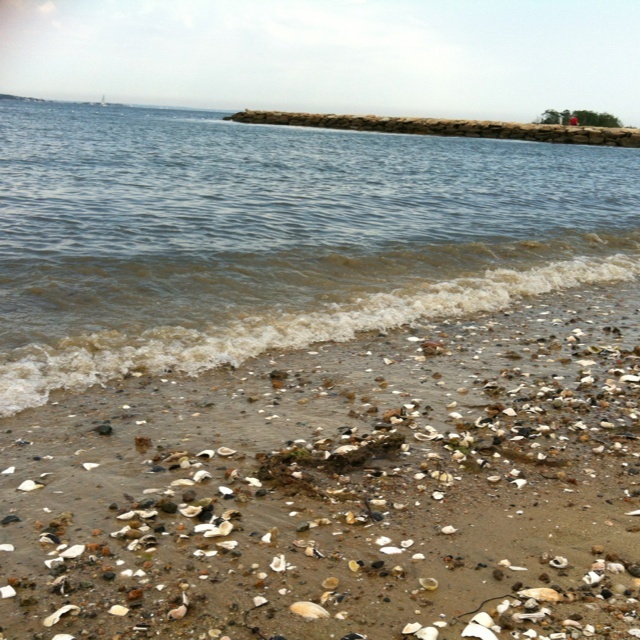 But the best days were the days we spent at Silvershell Beach. It was these memories, times spent on the sand and splashing in the ocean, that prompted me to write The Silvershell Beach Inn. What better way to honor my Massachusetts family than with a sweet romance on the beach where we spent all of our childhood summers? Of course the beautiful inn in the story is fictional. But all those memories I have of those summers on the beach? 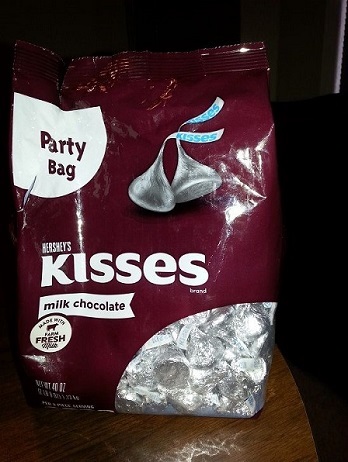 Those are the real deal and I will always hold them near to my heart. 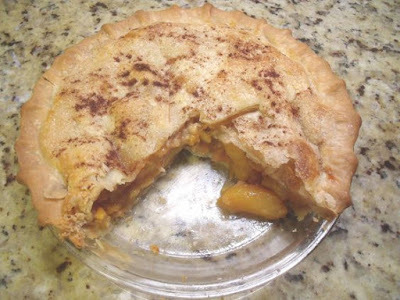 Because it’s peach season and picnic season and fresh fruit pie season, we’re featuring a recipe from author and former journalist Adele Downs for peach pie. 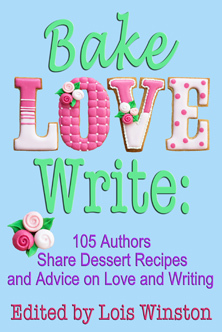 This recipe appears in Bake, Love, Write: 105 Authors Share Dessert Recipes and Advice on Love and Writing. A portion of the profit from the sale of the book goes to NoKidHungry.org. Learn more about Adele and her books at her website. Use ripe organic peaches, real butter, and as many other organic ingredients as possible for the best-tasting, old-fashioned double-crust pie you’ve ever eaten. Serves 8. 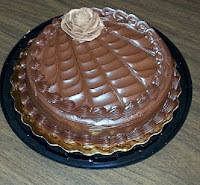 15 ounce package pastry for a 9” double-crust pie. Line 9” pie plate with one of the pie crusts. Brush with beaten egg to keep the crust firm. Place sliced peaches, vanilla extract, and lemon juice in a large bowl. Toss gently to coat peaches. In separate bowl, mix flour, cornstarch, sugars, cinnamon, ginger, and salt. Transfer the mixture to the bowl of peaches and toss gently. Pour ingredients into the pie crust. Dot with butter. Cover the pie with the second crust, folding edges under. Flute the edges or use the tines of a fork dipped in egg to seal them. Brush the remaining egg over the top crust. Cut at least four slits in the top crust to release steam while baking. Bake for 10 minutes. Reduce heat to 350 degrees F and bake an additional 30-35 minutes until crust is brown and the juice bubbles through the vents. To prevent the edges from browning too quickly, cover them with strips of aluminum foil about halfway through baking time, or use aluminum pie crust ring. Cool before serving. The authors (most of them) responsible for Sleuthing Women: 10 First-in-SeriesMysteries are back! Sleuthing Women II: 10 Mystery Novellas is a collection of ten mysteries featuring murder and assorted mayhem by eleven critically acclaimed, award-winning, and bestselling authors. Each novella is a tie-in to an established multi-book series—a total of nearly 700 pages of reading pleasure for lovers of amateur sleuth, caper, cozy, and female P.I. mysteries. Due to prior commitments, two of the authors from Sleuthing Women: 10First-in-Series Mysteries weren’t able to join us for the follow-up, but we’re thrilled to have NY Times and USA Today bestselling authors Allison Brennan and Laura Griffin teaming up for one novella and pioneering TV scriptwriter Rita Lakin for another. 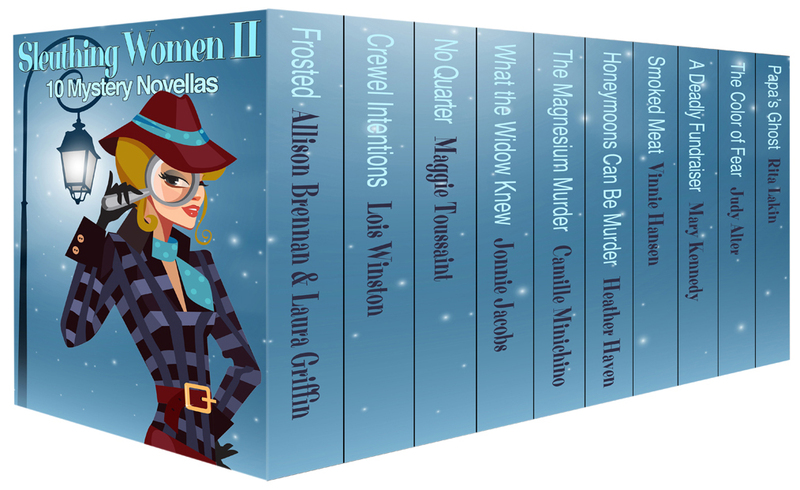 Sleuthing Women II: 10 Mystery Novellas is currently available for pre-order at the following sites and will debut on September 5th. Barbara White Daille lives with her husband in the sunny Southwest. Though they love the warm winters and the lizards in their front yard, they haven’t gotten used to the scorpions in the bathroom. She’s here today to talk about one of her favorite things—chocolate—which she’s incorporated into her featured book. Learn more about Barbara and her books at her website. I’ll confess, chocolate is my favorite food, snack, and indulgence, whether it’s included in cookies, cakes, ice cream, or served straight up. That’s a lot a chocolate! Maybe even enough to satisfy my cravings. Find that post here. Since everywhere you look, you read that sugar is bad for you, I recently decided to experiment to see what would happen if I gave it up completely…for a while. Of course, cutting sugar also meant going cold turkey on giving up chocolate, as it was the main ingredient in 99% of the items in my “goody drawer” in our pantry. The results of the experiment? A big surprise. Other than a few days of suffering a withdrawal headache, I didn’t miss either sugar or chocolate—and even lost some weight! As some people say, though, everything in moderation. 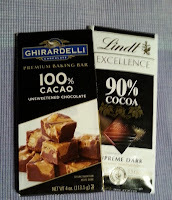 The goal now is to watch how much I eat while still allowing myself my chocolate indulgence. Even more important is keeping an eye on the sugar in those servings. To the right are a couple of things I’m trying to cut down on the sugar count. I haven’t yet used the baking chocolate, but the candy bar is surprisingly good. There’s a learning curve for your tastes buds, though, as the sugar content of each is much lower than in a standard serving. There are 3 grams of sugar in the candy bar, and 0 grams of sugar in the baking chocolate. I would love to hear whether or not you’ve ever kicked the sugar cravings and what tips you can share with us! I appreciate creativity in all forms, but I’ve often wondered, is there a difference between creativity and art? I’ve come to the conclusion the answer is up to the viewer and the gallery or museum curator. My husband and I recently returned from a vacation in Montreal and Quebec City. 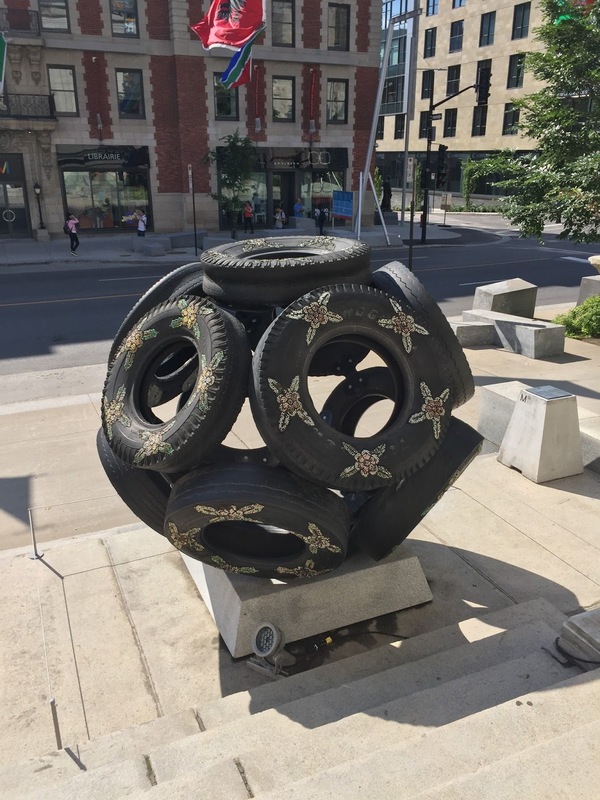 Both cities are filled with outdoor artworks. 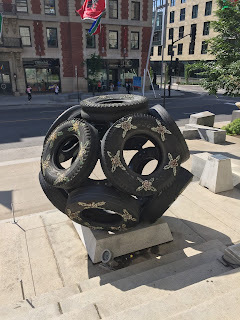 One sculpture, in particular, caught my eye outside the Montreal Museum of Fine Arts. 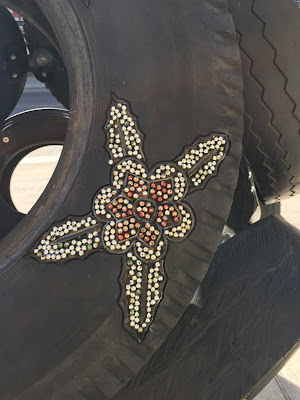 The artist (I couldn’t find a plaque listing the sculptor’s name) had bedazzled an assortment of truck tires. Now, bedazzling is a fun craft, especially for teens who love to bedazzle everything from their jeans and sneakers to their cell phone cases. 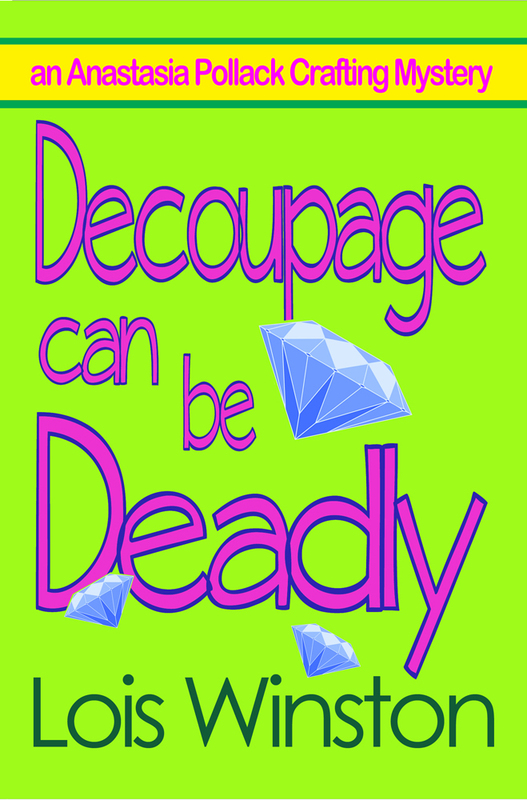 I’ve seen all sorts of items that have been bedazzled, including certain body parts, which I even wrote about in Decoupage Can Be Deadly. But truck tires? That was a first for me! 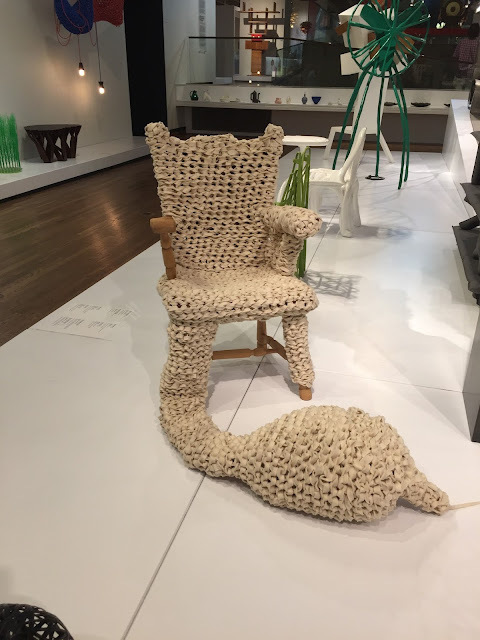 Is it art, or is it craft? 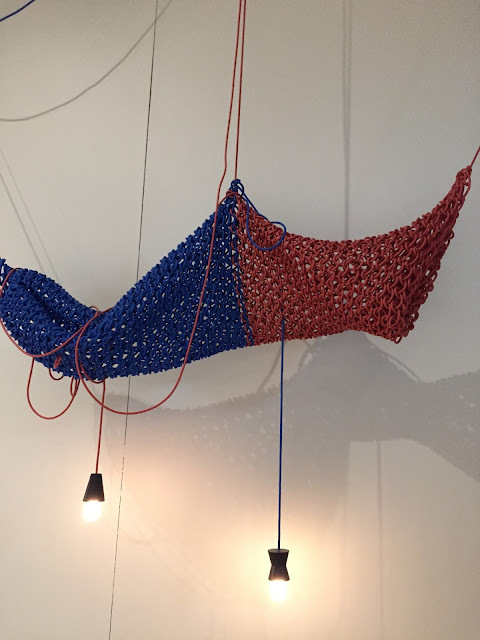 Obviously in Montreal the Museum of Fine Arts has deemed it art. What do you think? 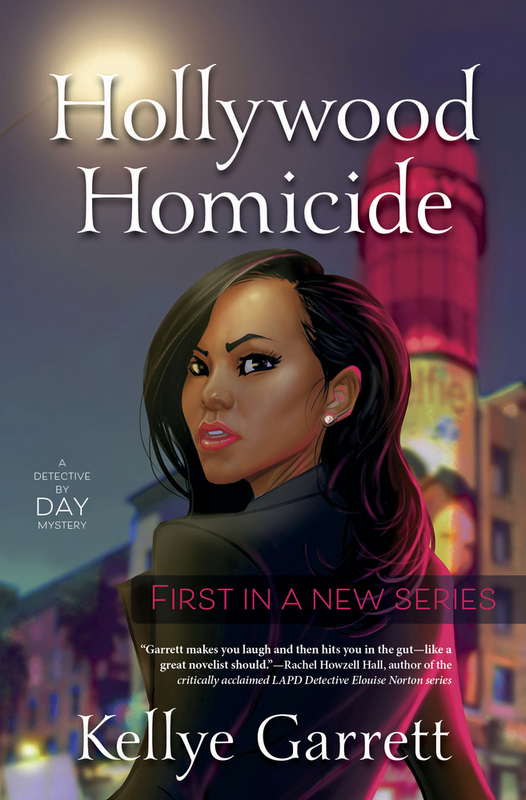 Kellye Garrett spent eight years working in Hollywood, including a stint writing for Cold Case. 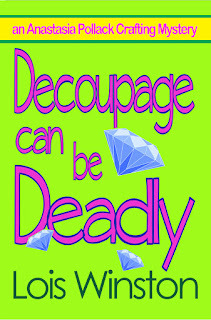 A former magazine editor, she now works for a leading media company and brainstorms ways to commit murder for her novels. Today she stops by to tell us about her favorite books. (We also think she should expand her love for mysteries with New Jersey settings to include the Anastasia Pollack Crafting Mysteries and the Empty Nest Mysteries 😀. 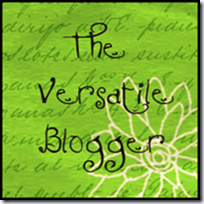 Learn more about Kellye and her books at her website. 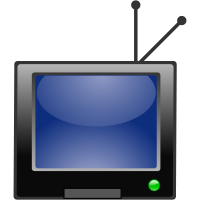 People love books and movies because it lets them explore different places. Oz. Hogsmeade. A Galaxy Far, Far Away. 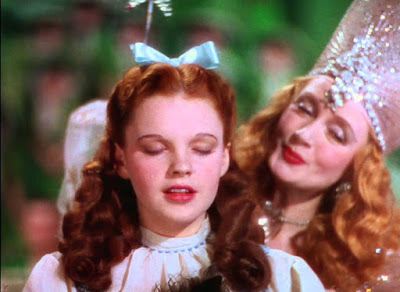 Although I love The Wizard of Oz, the Harry Potter series and the Star Wars movies just as much as the next person, some of my favorite books don’t show me a place I’ll never go. In actuality, nothing gets me more excited than when I recognize a place I’ve been in a book. You see as a long time mystery lover, book characters are my version of rock stars. And since I can’t have a celeb sighting of Kinsey Millhone from the Sue Grafton series or Spenser from the Robert P. Parker novels, I settle for the next best thing: location sightings. There’s nothing like seeing a place in a book and going “I’ve been there, too!” It makes the characters feel even more real to me. That’s probably why hometowns are often characters in a good mystery novel, whether it’s Spenser’s Boston or Kinsey’s Santa Teresa. 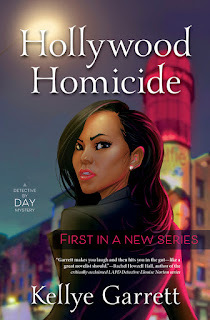 It’s why I made a point to pack in as many real Los Angeles noticeable landmarks as I could in my debut mystery, Hollywood Homicide. You’ll find Melrose Avenue (it’s more than just a place), the ArcLight movie theater (it’s the one that looks like a golf ball smushed into the ground) and the Warner Bros. Studio (their water tower is iconic). As much as I love Hollywood, I love New Jersey even more. I’m a loud and proud Jersey Girl, which for many people is known as that place people live because Manhattan is way too expensive. 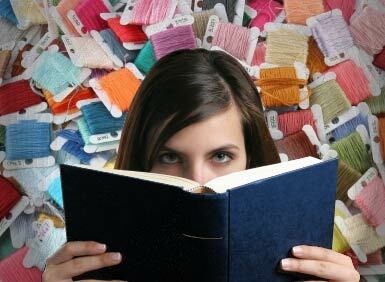 As you can imagine, I didn’t read a lot of mystery novels set in my neck of the woods. I can only think of two—and, no surprise, they’re two of my favorites. When I read these books, I’m not just getting amazing characters and great plots. I’m getting a sense of home. And like Dorothy said, there’s no place like it. 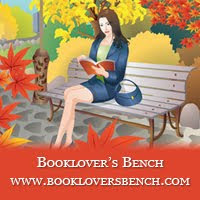 USA Today bestselling author Allie Boniface has written over a dozen romances, mostly set in small towns. She enjoys traveling with her husband when not teaching high school English or working on her next novel. Learn more about Allie and her books at her website. What better way to celebrate the dog days of summer than with a small-town romance series filled with heat and suspense? Summer’s Song, Book 1 in my Pine Point series, re-released yesterday with Entangled Publishing, so I’m celebrating today with one of my favorite sweet treats. I’ve always loved writing about the quirky wonderfulness of small towns, probably because I grew up in one (and I also currently live in one). They’re charming, often picturesque, and filled with characters who know, love, hate, and have all kinds of juicy gossip about each other – some that goes back generations! One of the best things about a small-town summer, in my opinion, is the classic backyard BBQ. Fire up the grill, set up some chairs and lawn games, and invite your friends over to eat, drink, and enjoy the long, warm days and nights. My classic go-to recipe, if I’m a guest at a summer party, is this Berry Trifle. I originally found it in a Cool Whip cookbook years ago, but I’ve tweaked it a bit since then. If you have a sweet tooth and love a colorful dessert that’s a little bit different from the norm, give this one a try! Pour cold milk into bowl. Add pudding mixes & beat with wire whisk for 2 minutes. Stir in 2 cups of whipped topping. Layer half the brownie cubes in the bottom of your serving dish (I like to use a glass trifle bowl, so you can see the colors). Top with half the pudding mixture, approximately one-third of the berries, and 2 cups whipped topping. Repeat layers and top with remaining berries and whipped topping. Refrigerate if not serving immediately. Then enjoy! 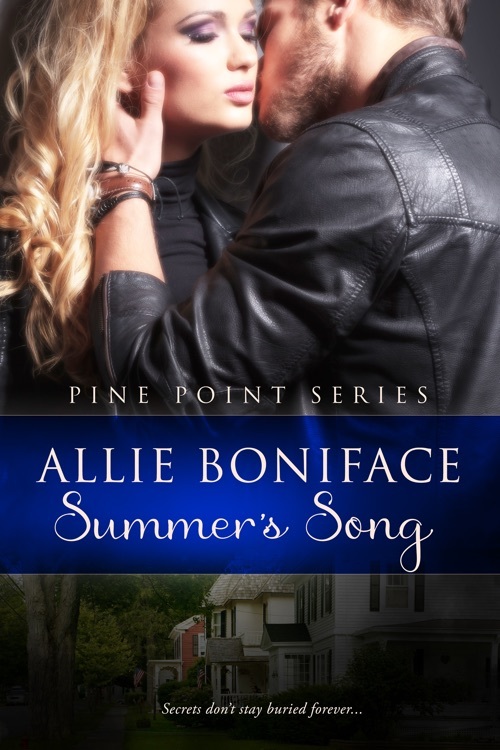 In Summer’s Song, the heroine comes home to Pine Point after 10 long years away. 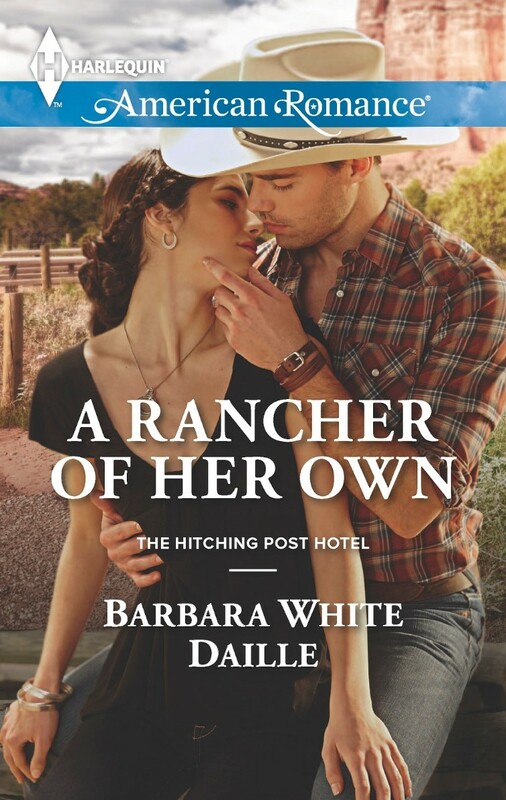 She doesn’t have plans to stay, but that changes once she meets a local hunky handyman. But like almost every main character I seem to create, these two have secrets waiting for them. Each title in the Pine Point series is on sale for only $0.99 through August 27 so you can treat yourself to this entire collection for less than $4.00! Even better, I’ve joined with 7 other Entangled authors to create a Hot August Nights giveaway. Happy Total (for those of you in the Path of Totality) Solar Eclipse Day! Ever wonder how people depicted a solar eclipse before modern photography? The Princeton Art Museum is currently featuring an exhibit of paintings by Howard Russell Butler (1856-1934). Butler was a graduate of Princeton University’s first School of Science. He was also a portrait and landscape painter who founded the American Fine Arts Society. In 1918 Butler, who had already established himself as a renowned painter of transient phenomena such as sunsets, was invited to accompany the United States Naval Observatory Eclipse Team to Salem, Oregon. At a time when photography was not yet sophisticated enough to capture the nuances of a solar eclipse, Butler’s painting, completed from memory and notes within hours of observing the eclipse, provided an account that astronomers heralded for its scientific accuracy. In 1925 the American Museum of Natural History commissioned a triptych for an astronomy hall Butler had designed. The hall was never built, but the triptych was later mounted over the entrance to the Hayden Planetarium. The smaller version pictured above was given by Butler’s son to Princeton University in 1958. The left panel is the solar eclipse from the 1918 expedition. The middle panel is the 1923 solar eclipse in Lompoc, California, which captures what is known as a Bailey's Bead, a bead of sunlight that is glimpsed briefly amid the craggy topography of the moon. The panel on the right is the solar eclipse of 1925 in Connecticut. 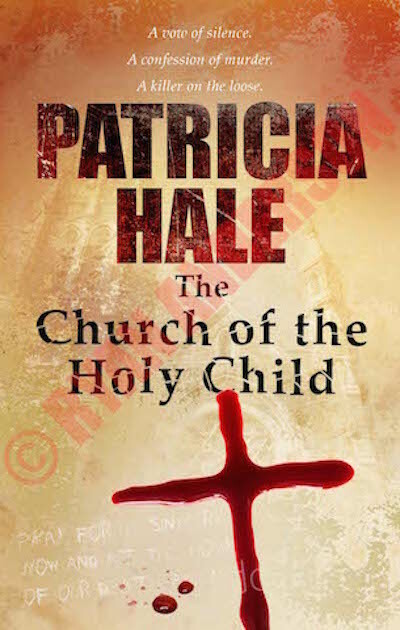 Patricia Hale writes mystery and suspense. Today she sits down with us for an interview. Learn more about her at her website. As a child, I wanted to write biographies. Then as an adolescent, I began writing poetry. I even sent one (handwritten in pencil) to the New Yorker. I received a very professional rejection letter. I was devastated and threw it away. Now, I wish I had framed it. When I had kids in my twenties, I wrote a few children’s stories, but I never sought-out publication. I didn’t try my hand at a novel until I was in my forties. After completing an MFA at the age of forty-two, I wrote two novels. I tried to get an agent, but never had any luck. They are both in the drawer of my desk. I read a lot of mysteries and decided I would give the genre a try. My first book, In the Shadow of Revenge, was published in 2013. I am traditionally published. In the Shadow of Revenge, was with Carina Press. The Cole and Callahan PI series is with Intrigue Publishing. The Church of the Holy Child is the first book of the series. I write at home in my office. Silence is golden while I write. But I do keep my windows open (whenever possible in New England). I like the everyday background noise; a breeze rustling the leaves, the birds at the feeder and the neighborhood dogs barking (usually my own). I don’t get plots from my own life. 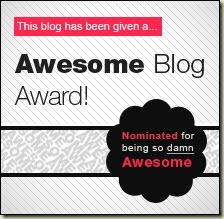 (My life isn’t nearly that exciting.) I do sometimes play with something I see in the newspaper. And I pull from friends and family for character traits or quirks. Since I write in first person, I guess you could say that many of Britt Callahan’s opinions are my own. It’s not very complex…. I sit quietly and think about the character, their looks and personality, and I almost always take the first name that comes to mind. I like to go with my gut. I tend to use both. 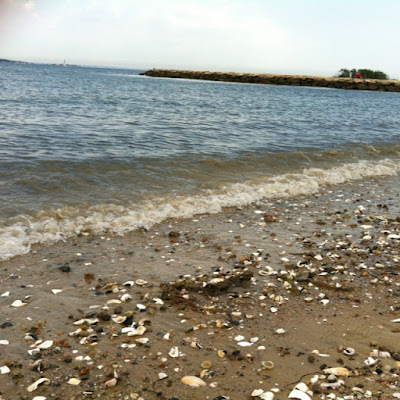 My series is set in Portland, Maine and since I lived in Maine for 20 years, I know the area. I enjoy reading a book that describes places I’m familiar with. I think others do, too. Britt Callahan smokes honeyberry cigars, a quirk I stole from a coworker. Maybe my dogs… I tend to fawn over them with the best of everything. We never miss our walks and I can’t leave them for too long, even a weekend away makes me anxious. People say, “They’re just dogs.” But they’re so much more than that. This might have to be a list instead of just one. Dark Places by Gillian Flynn comes to mind as does My Big Brother and We Have to Talk About Kevin, both by Lionel Shriver. The reason is the same for all three. The writing is excellent. I would have gone to college right out of high school instead of waiting twenty years. And I would have gone for a journalism degree instead of an MFA. More marketability. People who say, “Yeah, I’m gonna write a book someday.” Like it’s on their to-do list along with painting the kitchen and losing 10 pounds. My dogs, my computer and books. Packing strawberries. I stood on a cement floor with twenty other women for 8 hours a day with a half-hour break. I didn’t have a car at the time and rode my bike 10 miles each way. The ride in the morning wasn’t bad, but the ride home was killer. I only lasted two weeks. Definitely mountains. I have always lived on the coast, but travel to the woods and mountains as frequently as possible. It’s where I rejuvenate. I’m a country girl, without a doubt. I visit the city and enjoy it while I’m there, but I can’t tolerate the noise and so many people for longer than a day or two. I’m anxious to take the two novels I wrote ten years ago out of my desk drawer. I am committed to the stories and believe I can bring them both to fruition with some re-writing. The bodies are piling up, and one person knows where the killer is. Father Francis, a priest at The Church of the Holy Child, listens to the killer’s disturbed account of each murder and wrestles with the holy orders that bind him to secrecy.